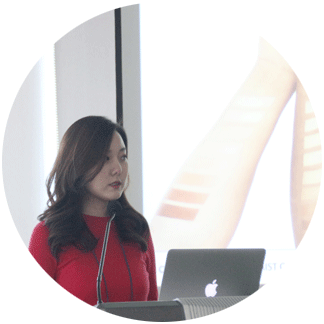 Yuchun and Juhyun Lee(COSMAX BTI Researcher) made an oral presentation about “skin color” at 2018 Fall Conference of Korean Society of Color Studies in KAIST. Yuchun presented an article entitled as “Affective Effect of Target Skin Color,” the part of her master thesis. In this research, how people perceive the same portraits concerning different target skin color was investigated. Target skin color was obtained from the literature review of three aspects of skin researches, real skin color, memory skin color, and preferred digital skin color. Through the evaluation, she concluded that different target skin color setting could lead to different emotional image qualities. Juhyun also presented an article entitled as “Analysis of measured, reports, and pursued skin color.” This study collected standard quantified data on the skin colors of Korea men and women using spectrophotometer, and surveyed self-reported their skin color. The experiment result indicated that skin color is very complex and there are color differences especially between facial and hand. Hence, it could be said that there are many errors when consumers choice makeup products. In addition, the pattern was found that consumers wanted to be like their ideals, not redeem. Juhyun Lee won the best presentation award, and Yuchun Yan and Hyeon-Jeong Suk were the coauthor. Congratulation!